If you were at all amused at the narrative of how I came about obtaining Engine 17, you might want to read the first several posts of my sister's blog, which is a thorough review of her point of view of the same events. I just finished re-reading it, and was again amused. It is much easier to be nuts when you can freely admit it. Now, to get it home. I put out a few very long-shot emails along with yesterday's post, and got exactly one hit. The person who wrote back had purchased the unit about a year for purposes I knew not... for resale (already gone) or for his own project (not for sale)... who knew? But the long shot paid off, and I have agreed to meet his asking price. Attached are some pictures. More to come of course when it arrives in a few weeks. Installing this light will probably be the first significant task on E17 since removing the markings. Mechanical issues are more important, but this symbolic job will mean a lot. Looking for a what? Good luck with that! The rotating warning light currently on Engine 17 is not original equipment. These rigs were delivered to Tacoma with domed strobe lights. Even though they may have been state-of-the-art in 1970, even as a kid I thought they weren't very effective. One blink per second or so, sometimes a double blink. Not very bright. Useless as a warning device by day, and of marginal value at night. In today's brightly-lit nights, fighting against HID headlights and LED traffic lights, they would be useless. Usefulness is not important, though. I'm going for a proper restoration, not trying to run calls and bust intersections. It came with a useless strobe, and I want a correct useless strobe again. What is this useless light? Well, I had no idea. After a modicum of research (going to the ALF owners group with a picture and pitifully saying "help"), I was informed that what I need to obtain is a red-domed Whelen Commander 5000 strobe. Web searches are not promising. Nothing on eBay at the moment. A few whackers who have discussed this model are on a site called 'elightbars.org', and although I swallowed my pride and signed up to see if anyone would sell me one there, they never approved my registration request. Not whacker enough, I guess. So.... if you have a line on one of these or know someone who does, you know I would be eternally grateful for the heads up. Below are two pictures. The dalmation-painted engine is one of Engine 17's seven identical sisters, purchased directly from Tacoma by a sub sandwich shop in Florida. In fact, this rig's Serial Number is the sequence before mine, they apparently 'rolled off the line' back-to-back. It still has its Commander 5000 strobe. The black & white picture was provided by a member of the ALF owners, and the two ALFs on the left are sporting Commander 5000's. This blog got an unexpected and pleasant surprise when the Happy Medic briefly shined his spotlight on us here. The visitor stats went through the roof, of course, because his blog has become a hotspot in the Fire/EMS world over the past year. I don't have anything useful to add as far as updates on Engine 17 go, but wanted to thank you all for coming in and taking a look at this small little drama playing out at my place. Having this old engine is really special, and I am glad to share the story. Well, I feel silly about this, but.... well, last word I got about my engine's original identity was incorrect. I shouldn't have jumped the gun until it was "confirmed"-confirmed... I was working with an indirect, unofficial notification. My bad. Turns out, my engine did not start out as Tacoma Engine 2 before becoming Engine 10. TFD historian Ralph Decker has confirmed that my engine joined Tacoma's fleet as Engine 17 in 1970. 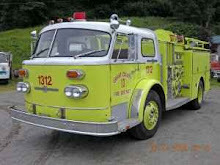 When Engine 17 was replaced with an American LaFrance Century Series in 1976, my engine was reassigned as Engine 9. When Engine 9 received one of the 1980 Mack CF pumpers, my engine was then assigned to Engine 10 for the rest of its Tacoma front line career, being moved to reserve status in 1987 and sold in 1989. Sadly, the building in service as Station 17 in 1970 is no longer a fire station, so I will be unable to get meaningful pictures of my rig in front of that location. The Tacoma Fire Department moved Station 17 to the City of Fircrest in 1995, and remodeled the old station into administrative office space. So once again the blog name has been updated and is now under a new address. This should be the last time! What else can go wrong? !